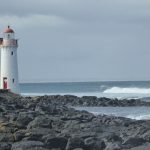 There’s no public access these days to Griffiths Island lighthouse near Port Fairy, but it stands on such a magical spot, right by the waves of the Southern Ocean, that it’s definitely worth a visit. We went down on a day trip towards the end of August, on a chilly morning with squally showers hitting every half hour or so. In fact, our visit to the island began with a ten minute shelter from the latest rain burst under the cover of the information shed just on the edge of the mainland. 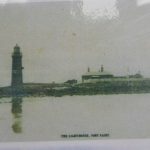 Actually, that’s worth a visit anyway, as it has some nice photos of the lighthouse when the keeper’s cottages were still next door and the lighthouse itself was painted red (though hard to tell in the black & white photo). You then reach a point where you have to decide if you’ll walk around Griffiths Island clockwise or anti-clockwise. The information boards recommend anti-clockwise for more shelter from the ‘prevailing’ winds. We didn’t have much option, though, and went clockwise along the boardwalk, as the concrete causeway in the other direction was partially covered by pretty fast-flowing water (if we’d come prepared, and had shorts on, we’d probably have managed this as the water wasn’t deep, but on this cold winter’s day, and with jeans and normal footwear, we just didn’t fancy trying). 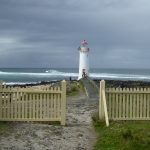 Funnily enough, at that junction where the two paths split, we had to walk through a pile of kelp, which suggests that on some days, even this section of the boardwalk would involve getting your feet wet if you are determined to reach the lighthouse. It wasn’t busy on the island the day we visited. 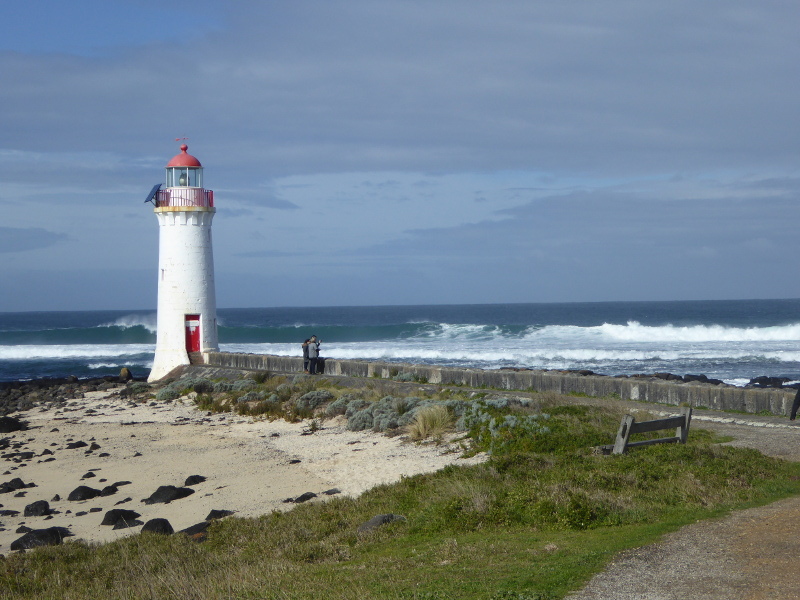 There were as many surfers plying the route to the lighthouse as there were walkers (though sadly none were in the water when we actually reached the lighthouse ourselves – it would have been nice to watch them glide by the beautiful white building). 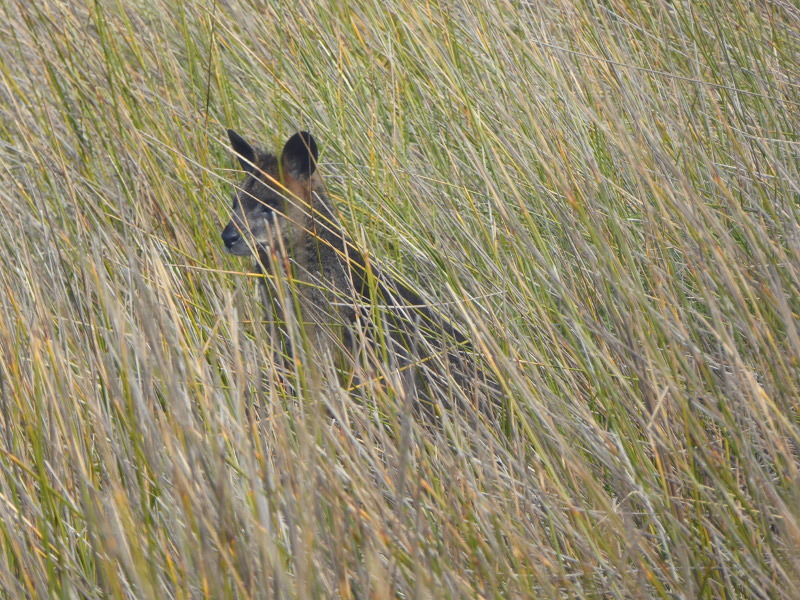 The lack of humans probably drew out more of the local fauna, and we had the delightful sight of a little brown wallaby poking its head above the reeds and grasses a few metres from the path, as well as all kinds of birds along the beaches, and the local residents – shearwaters – whose burrows kept appearing along the path and just in the underlying greenery. They, by the way, are the reason why there are warnings every few yards NOT to leave the marked track around the island. 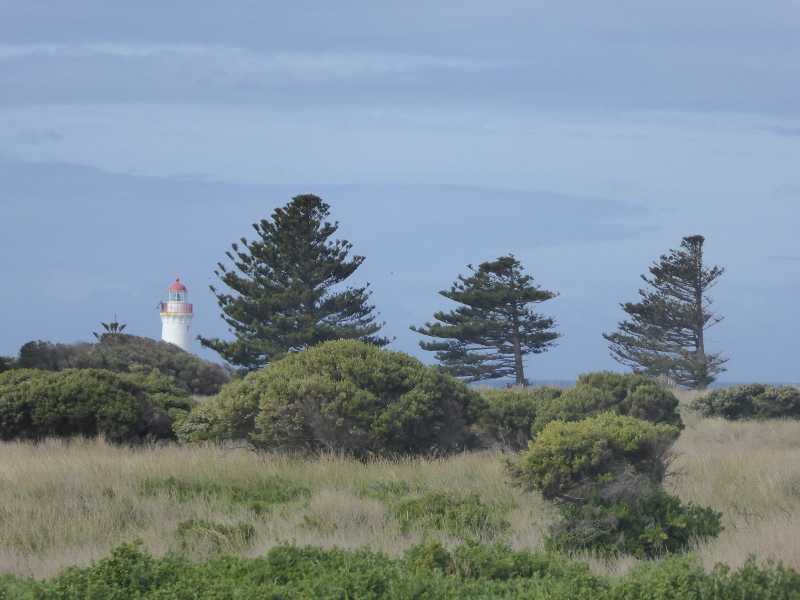 You can tell when you reach the old lighthouse grounds, as the row of Norfolk Pines lines the old boundary of the cottage gardens on what was once a separate island (Rabbit Island was then cut off from both the mainland and Griffiths Island). And you can see how well tended those cottage gardens used to be from the daffodil bulbs that still flower every winter and are dotted around the area. All that remains of those old cottages are the stone foundations, plus a section of painted picket fence, which would have been the entrance gate to the property (see photo of those cottages in the gallery). 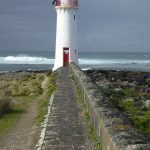 From there, there is a low stone wall and path leading about 100m to the lighthouse itself, which sits incredibly low and close to the ocean. 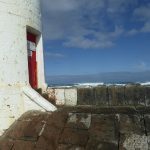 It looks as if the waves sometimes come up over that wall even today, so it must have been quite an adventure to leave the keeper’s cottage in a storm on a high tide to reach the lighthouse itself. Three stone steps lead up to the red front door, but there is no access to the public these days, which is a shame. The classic little windows dotted around the walls of the building show that there is a spiral staircase up to the little balcony alongside the light itself. That’s the only other part which remains red to this day. 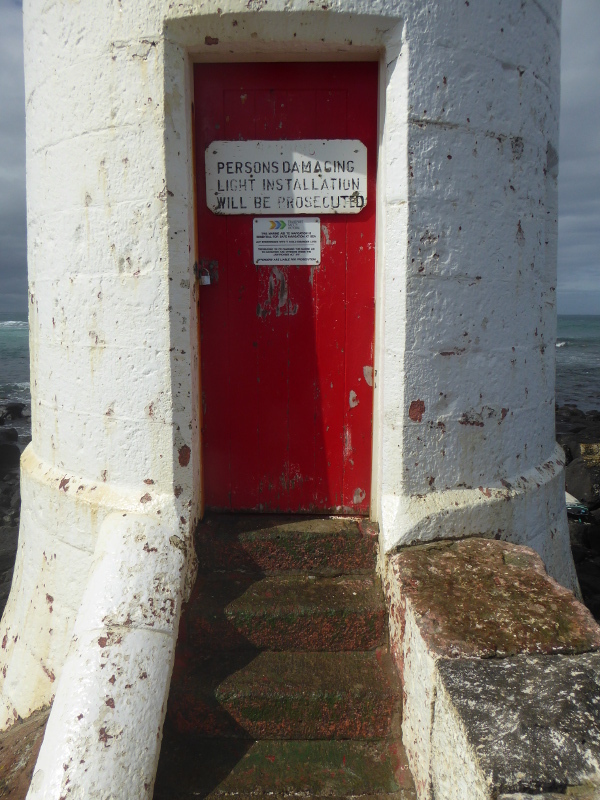 It must have been an amazing place to stand in a storm when the lighthouse was first built in the late 1850s. 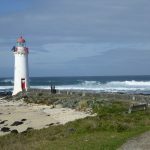 We continued our walk clockwise, past a tiny old quarry, past beautiful beaches which reminded us of the Galapagos for their emptiness and the turquoise colour of the waters (all that was missing were the seals, though apparently even they can be seen some days). We didn’t continue the full circle because we had no idea what direction the tide was in when we had seen the causeway partially covered, and another shower looked as if it was on its way (there is no shelter anywhere on Griffiths Island). So we returned to our start point using the way we’d come, and found of course that the tide had gone out. 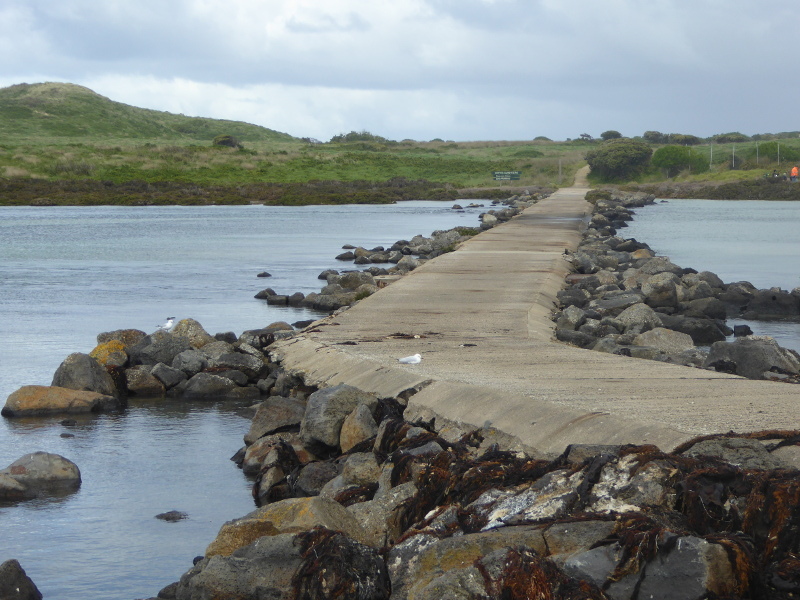 The anti-clockwise causeway was now clear and a local gent was walking across with three kids, all carrying buckets…to collect what, we wondered? 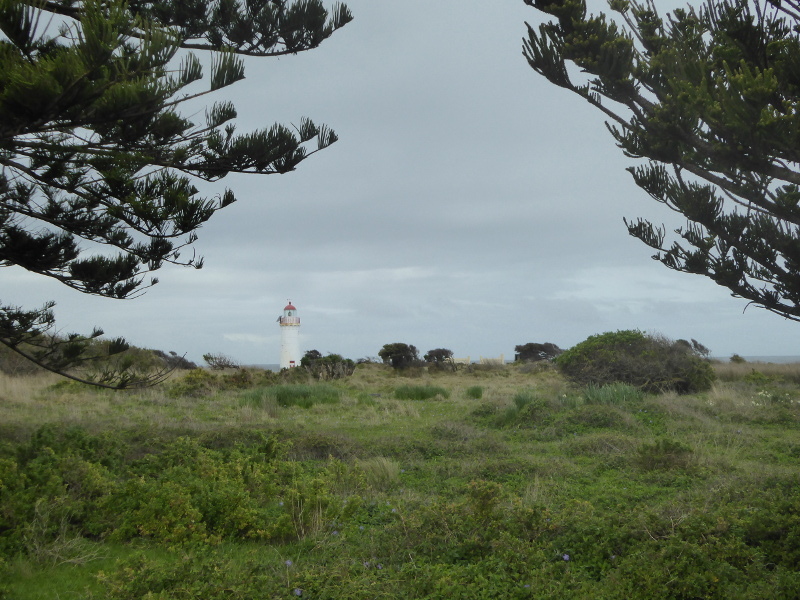 We loved Griffiths Island, and resolved to come back in summer for a dip in what looked like pretty sheltered waters, though we’d be on the look out in January for the local snakes, which apparently cross the island paths frequently, when they’re looking after their young. 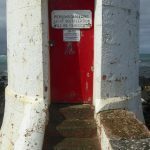 No public access to the lighthouse. 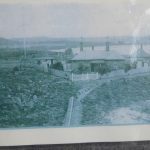 I love some of the snippets of information you can pick up by searching through the Trove website of the National Library of Australia. 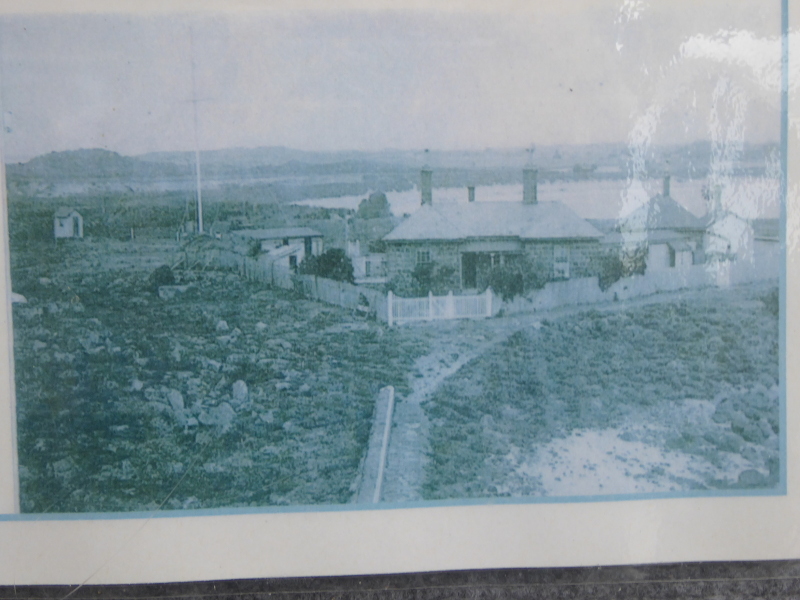 There, I learnt of the 50ft whales seen off the reef near the lighthouse in July 1909. I read of the note in a bottle found on the beach in 1916 by the keeper’s daughter, which spoke of being in South Australian waters and having a good time on board a ship (ah the days of chucking messages in a bottle to see where they’d end up…). I found mention of a tramline from the nearby bluestone quarry, but there’s no sign of it now. 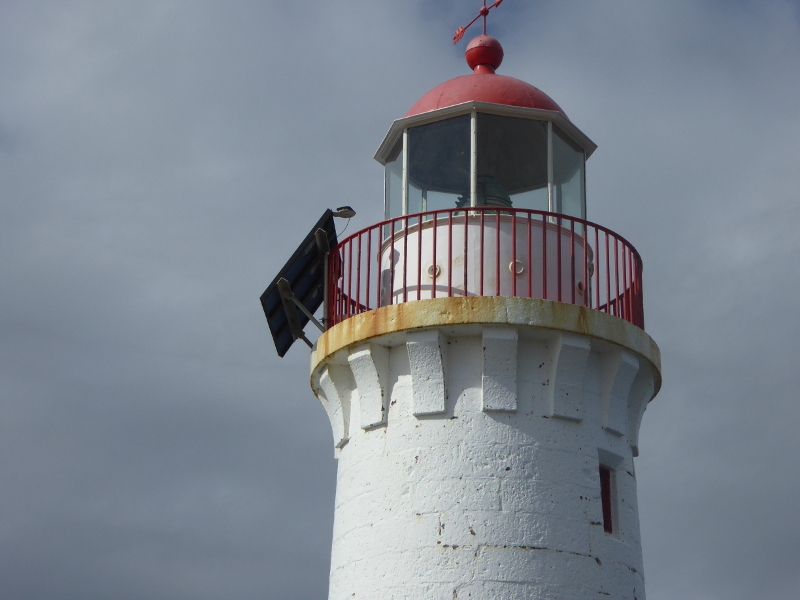 But it’s the lighthouse keepers who make the best stories from Griffiths Island. George Ford was the first keeper 1859. 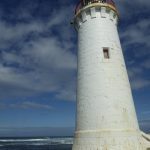 Mr Porteous (whose name has cropped up in connection with other lighthouses along the coast), refused an offer of a transfer in 1913, though he took up another post a few months later so was probably holding out for his preferred option. Thomas Ferry Pearson, a Geordie, had been in charge of the lighthouse (or maybe the pilot scheme) from 1861-74. One social commentator at the time of his death in April 1915 said ‘Pearson had a mind of his own and was fairly free at times in expressing it.” Sadly, he apparently died of ‘senile decay’ and is buried in the Presbyterian cemetery. But his diary has excerpts in the town’s tourist leaflet for Port Fairy, so I learnt that Thomas Pearson had a beehive, kangaroos, an emu and a veggie patch. He rowed into town for groceries! 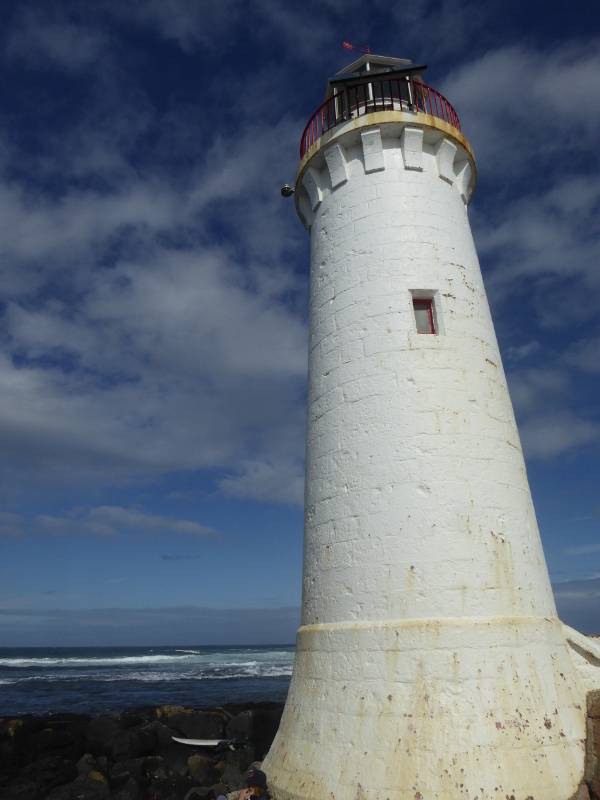 I’ve chosen a 1930s lighthouse keeper, Thomas Haldane for the people connection to Port Fairy Griffiths Lighthouse. He came to Australia from Glasgow with ship building experience and that led his three sons to get into ship building locally. In 1931, one of his sons blew part of his hand off handling some dynamite. But that didn’t stop him getting into building ships later in life as part of Haldane Brothers into the 1950s and beyond. 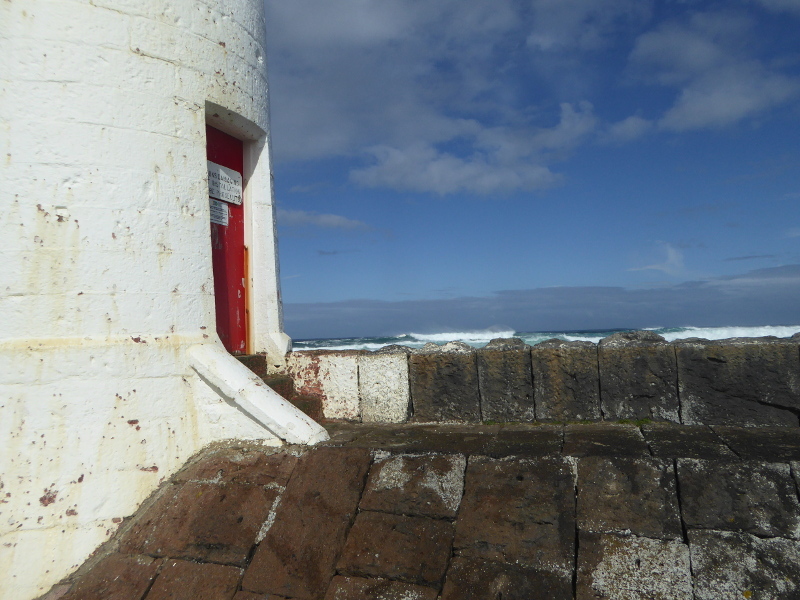 I loved a story from 1936 which showed the variety of life as a lighthouse keeper. 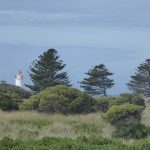 Mr Haldane was in touch with a group of ten scientists who wanted to study the seal colony on Julia Percy Island, which is some way off the coast to the SW of Port Fairy. The 10 took six tents with them and slept there on the island to study the 8,000 seals on the spot during breeding season. I can just imagine this Glaswegian getting irate enough over a false reference to Scotland’s national hero to want to pen a letter to the paper to correct things. I’d like to have met Mr Haldane and hear more of his tales, that’s for sure. 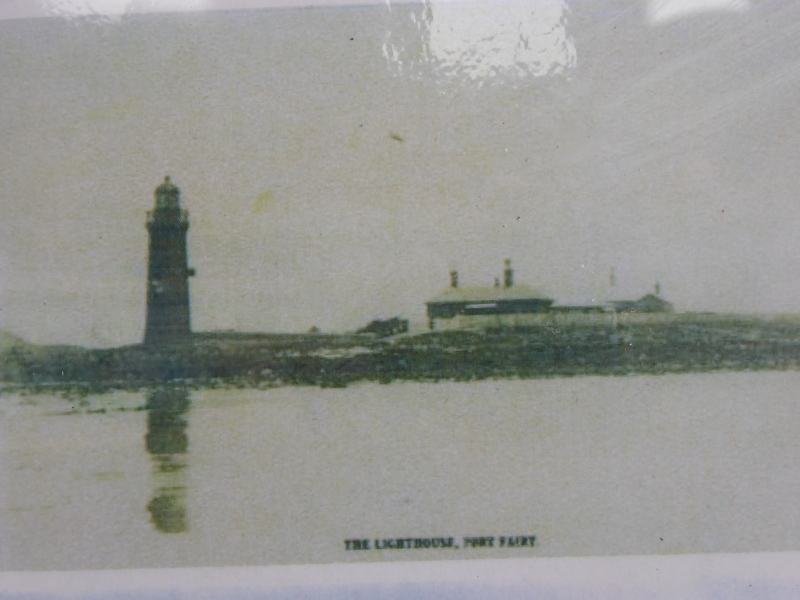 He was the last lighthouse keeper on Griffiths Island, and left in 1954. 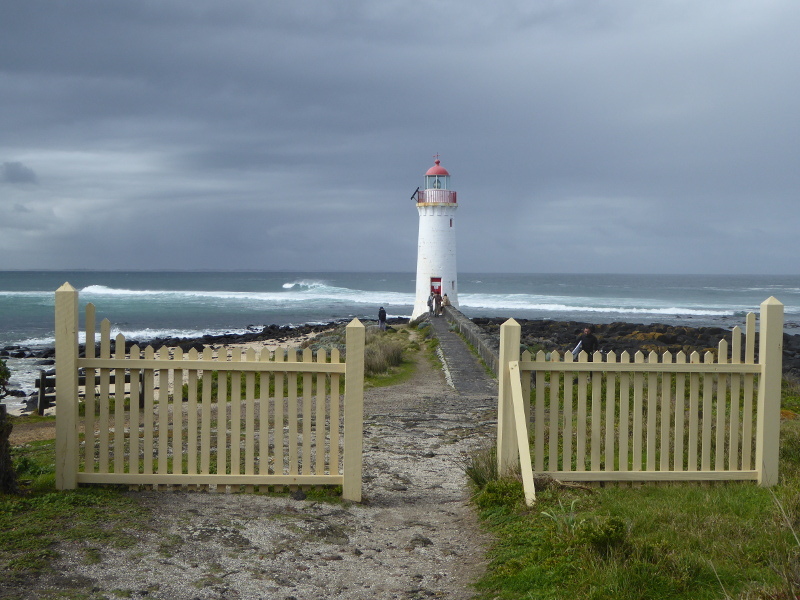 What are your experiences at Port Fairy lighthouse on Griffiths Island? Does anybody else have stories to tell of their own visits or escapades in and around Griffiths Island? If so, I’d love to hear them, so send a comment in below. And any connections back to that Haldane family would be fascinating, so get in touch if you have any. 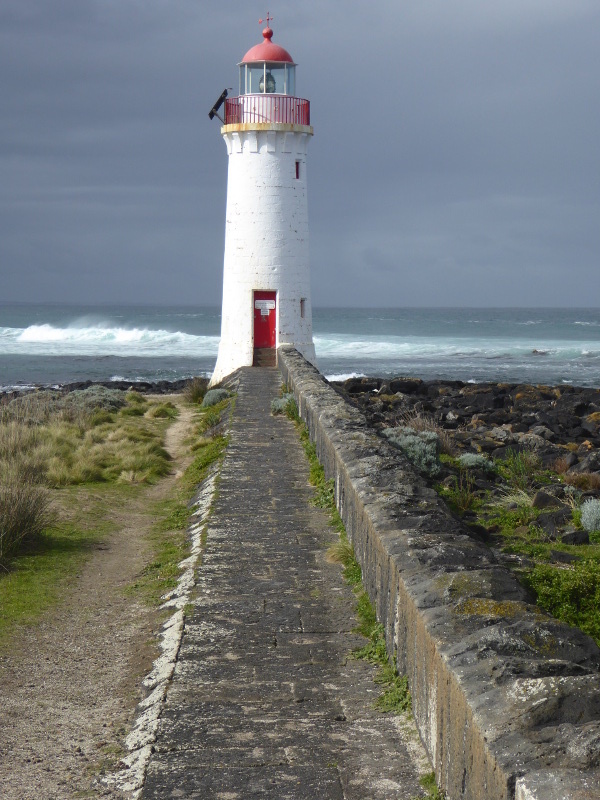 The official Port Fairy tourism website has a brief introduction to the lighthouse. 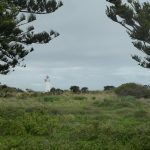 The ABC South West Victoria ran a series on lighthouses in 2008, with this blog post, which also has some audio on Port Fairy lighthouse. 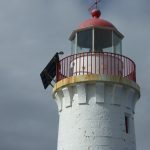 I like this post on the Historical Rag Bag website, partly because they actually got inside Port Fairy Lighthouse and filmed the spiral staircase. Lucky them. 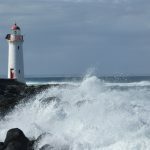 Happiness and Things is a travel website run by Silke from Berlin, who took some great shots on Griffiths Island, including of the lighthouse. 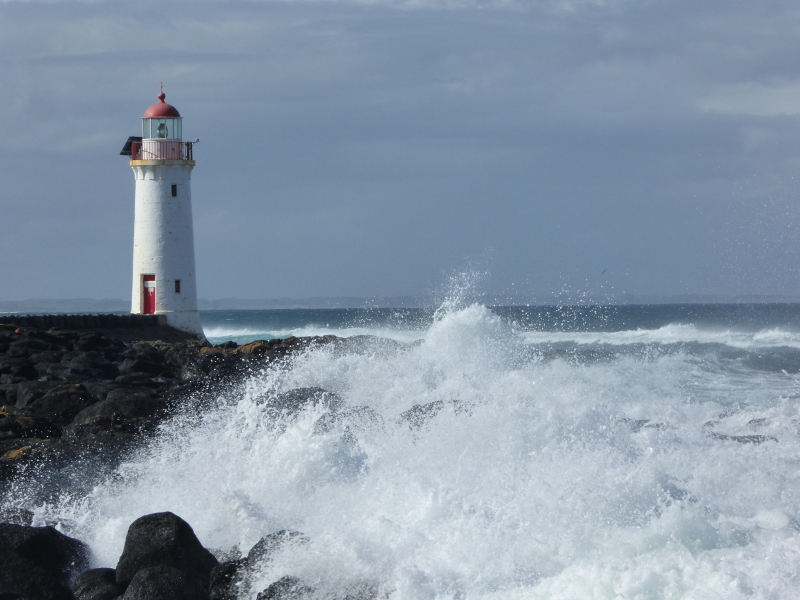 Photographer Rodney Campbell took some stunning sunrise photos at Port Fairy Lighthouse. Cup of tea after your tour of Griffiths Island? Best coffee in Port Fairy surely has to be at the Driftwood Cafe, which served up coffee good enough to grace the streets of Melbourne. Friendly local place, where we chatted with the owners and got into a conversation about Bruno Ganz, the German film actor, of all subjects. Port Fairy also has a vintage cinema, so we’ll be back before too long….Just beware of Driftwood closing time if you are planning an afternoon stroll followed by a tea or coffee. They close quite early, we thought. Hi, thanks for linking to the blog. 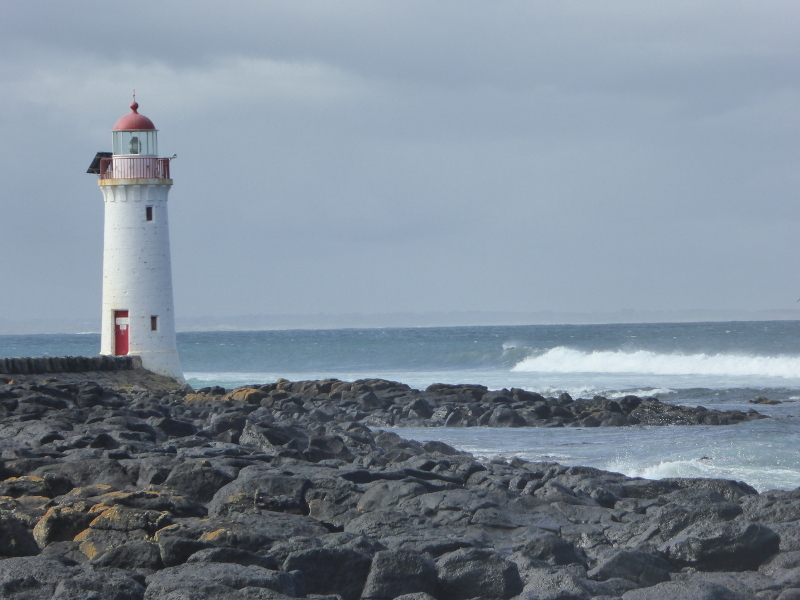 I’ve been going to Port Fairy for nearly 30 years and until about six months ago I’d never been inside either, I happened to be down on the queen’s birthday long weekend and it happened to be one of the rare occasions when it’s open to the public. Did have to queue for almost an hour though (they were only letting about five people up at a time and they let you look around at the top) totally worth it, it’s fascinating.